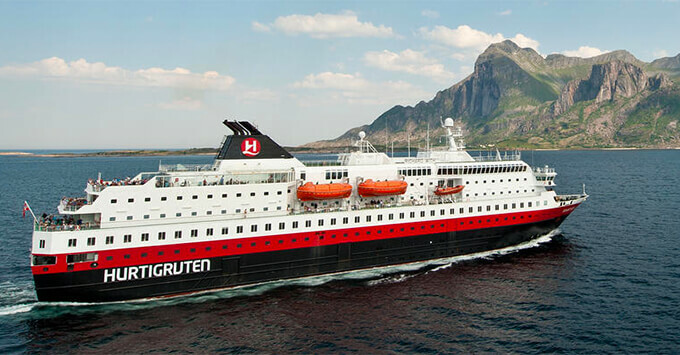 (1:40 p.m. GMT) -- Expedition cruise line Hurtigruten has revealed its 590-passenger Richard With has entered Norway's Fosen Yard shipyard this week to undergo a month-long full ship refurbishment. Richard With will emerge from dry dock on December 6 with all cabins, suites and passenger areas upgraded in what is set to be the largest refurbishment project in the line's history. Daniel Skjeldam, Hurtigruten's CEO, said: "We are thrilled to give the ship named after our founder a standard Richard With himself would be proud of. What we are doing will add a new dimension to the expression total makeover." During the month long dry dock all cabins will be upgraded to be in line with Hurtigruten's newer ships; on Deck 6, a number of cabins will be merged to create 14 larger suites, complete with bay windows. Dining venues will also be refurbed, including Torget, the ship's main dining room, which will get a full makeover and large deck-to-ceiling windows added to maximise light and ocean views. The ship's Arctic specialty restaurant, Kysten Fine Dining, will get a new look that is different from the style on other ships. It will also be open for a la carte lunch service. The Brygga bistro will be replaced with an upgraded and larger arcade and a brand-new Activity Center, which will form the onboard base for Hurtigruten's expedition team. Two new lecture halls will also be added. The ship will also get new "shore power" facilities and a new air condition system. "Hurtigruten is strongly committed to being the frontrunner in green change. As we introduce the ships on the Norwegian coast, they set new standards for the industry to follow," Skjeldam said. The 530-passenger Roald Amundsen will be the first of Hurtigruten's new hybrid-powered expedition ships to be delivered -- slated for May 2019 following nearly 12 months of delays. Fridtjof Nansen will follow in 2020, after also being delayed.